President Trump this week signed a pair of executive orders that will pave the way for construction of both the Keystone XL and Dakota Access crude oil pipelines. Together the pipelines will bring 830,000 barrels of cheap crude oil per day from Canada and the Bakken shale formation to U.S. refineries. The Dakota Access pipeline will carry 570,000 barrels per day along its route from North Dakota to distribution points in Illinois. We have long supported both pipelines projects as a way to increase plentiful supplies of domestic crude oil which in turn will keep the cost of heating oil and other fuels down. A recent article on Forbes.com states that natural gas prices are poised to increase 40 to 60 percent. "Natural gas prices averaged a little more that $2.50 per million Btu in 2016. Those days are over" the articles states. "Prices will average $3.50 to $4.00 in 2017. Prices have more than doubled since March 2016. "Supply is tight because demand and exports have grown, and shale gas production has declined." To read more about this story and for a link to the original Forbes. com Article, visit American Energy Coalition.org;. The majority of deaths and injuries involving hot water scalds are to children under the age of five and the elderly, The U.S. Consumer Product Safety Commission urges all users to lower their water heaters to 120 degrees Fahrenheit. In addition to preventing accidents, this decrease in temperature will conserve energy and save money. Use the programmable settings year-round to automatically adjust the temperature of your home during times of the day that you're away. This will help you to maximize your home's indoor comfort AND efficiency, which will help you to save energy and money! You ask for it... you got it! You can make your payments online and also check your delivery and payment history . We will be making changes to expand our online offerings, so visit often! I wanted to take a minute to thank our long time customers for their years of loyalty! I also wanted to remind everyone that we not only have a full in house service department and I think is second to none but we still always have offered fuel oil and service agreements to our heating oil customers. Coming soon. You will have the ability to order your heating oil online any time day or night and pay for the fuel oil delivery at the same time. If you feel warm air coming out of your air conditioning vents when your blower is running or ice is forming on your outside air conditioning lines air conditioner you could be low on refrigerant. Call JC Heating we can help. With the extreme heat we have the last weeks, JC Heating is responding to a large number of air conditioning service as a result or power surges and brown outs, in the Washington Crossing and Yardley area. The damage we are seeing is to compressor's and circuit boards. Many of these expensive calls could have been prevented with a whole house surge protector or an air conditioner surge protector. Our Service Department can install whole house and HVAC equipment surgue protectors for you equipment. Q: Please help me sort fantasy with reality with regard to oil-eat bacteria I have heard about. Can they clean up leaky oil-storage- tank messes in the soil? A: Leaking underground heating oil storage tank problems can indeed be eliminated naturally through bioremediation. Naturally occurring microbes are released onto a contaminated area and consume the hydrocarbons, converting them into carbon dioxide, water, trace carbon, bacterial cells and fatty acids. Microbes are found everywhere, and are the basic recyclers of organic materials. The average human body carries 3 pounds of microbes in the body. The trick is choosing the correct microbes to get the job done. Microbes are typically kept in an inert carrier until ready for useage. In order to work they need what all organism need: water, food hydrocarbons (oil), an acceptable temperature (32 to 140). Once activated with water, the microbes go to work, the time necessary being dependent upon the concentration of the mess. After chowing down, the microbes will die, return to natural concentrations levels, or be eaten by other organisms. The bioremediation calendar can be long, from 120 days to a year. JC Heating & Cooling Handles Both Residential and Light Commercial AC Installations and Repairs. 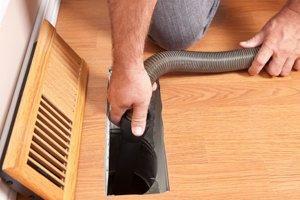 Duct cleaning is one of those tasks that it's easy to forget about. Since ducts and vents are often overlooked, many homeowners might not even remember the last time they had them attended to. The fact is, however, that duct and vent cleaning may have health advantages, and might even reduce your energy bills and extend the life of your forced air system. One thing to consider when you're thinking about vent and duct cleaning is the fact that indoor air quality is decreasing. This is due in part to the popularity of high-efficiency windows, doors, and increased insulation that reduce the amount of air transfer between inside and outside. Though these fixtures are great when it comes to reducing energy costs and making a room more comfortable, they are often not supplemented with any additional ventilation, causing pollutants that enter the home to remain inside instead of leaking out through drafty windows and gaps. The verdict still isn't in on whether or not duct and vent cleaning is going to improve indoor air quality in every situation. Though there is literature out there to support either side of the debate, we do know that in certain cases, duct cleaning is likely to find and remove harmful molds, fungus, and/or microbes from an infected system. At the very least, duct and vent cleaning is not going to do your home any harm, and there is a chance that it will actually increase the quality of your indoor air. Proper cleaning of a home should take a minimum of three to five hours, depending on the size of the house. If the home has more than one heating and cooling system, or the system is located on the roof, it can take longer and cost more. If a low price is offered, a consumer needs to make sure that the price includes a thorough cleaning, including registers, the inside of the ductwork, and all the fans and coils. Charging extra for cleaning fans and coils is unreasonable because those steps are mandatory for having a properly cleaned system. Make healthy air in your home your goal. How? First, keep pollution out. Here are some easy, but important tips for healthy indoor air. Declare your home a smokefree zone. Never let anyone smoke indoors. Ask smokers to go outside. Test your home for radon, an invisible gas that causes lung cancer. Every home should be tested since radon may be found in any home. If your home has high radon, it can be fixed. Keep humidity levels under 50 percent. Use a dehumidifier or air conditioner, as needed. Clean equipment regularly so they don't become a source of pollution themselves. Fix all leaks and drips in the home. Standing water and high humidity encourage the growth of mold and other pollutants. Put away food, cover trash and use baits to control pests, like cockroaches. Avoid burning wood because it adds pollution indoors and out. Don't use outdoor wood boilers, also called hydronic heaters, to heat your home's water. They add unhealthy soot to the air in your neighborhood. Don't use scented candles or fragrances to hide odors. Figure out what is causing the odor, then clean that up and ventilate to add fresh air. Use cleaning, household and hobby products that are less toxic. Don't store hazardous chemicals in your home. Keep your house warmer than normal when you are away, and lower the thermostat setting to 78°F (26°C) only when you are at home and need cooling. A programmable thermostat can make it easy to set back your temperature.Avoid setting your thermostat at a colder setting than normal when you turn on your air conditioner. It will not cool your home any faster and could result in excessive cooling and unnecessary expense. If you use air conditioning, a ceiling fan will allow you to raise the thermostat setting about 4°F with no reduction in comfort.Turn off ceiling fans when you leave the room. Remember that fans cool people, not rooms, by creating a wind chill effect. There are few things sweeter than coming out of the heat into your comfortably air conditioned home. Unfortunately, air conditioning isn’t something we often think about – that is, until it breaks down on a 100-degree day. You may not realize it, but your A/C unit loses around 5% of its efficiency for each year that it runs. Over time, components weaken and break down, and without routine maintenance, you could end up paying some major repair bills or having to replace the unit altogether. Fortunately, you can keep your A/C running at full capacity by simply scheduling a regular tune-up. Giving your A/C a little TLC once or twice a year is important and can save you a lot of money and headaches in the long run. You’re probably keenly aware of how high your power bills can get during the heat of summer. The A/C is a huge power hog, and it will pull more and more power for each year that it goes without maintenance. Even if you have an energy-efficient A/C, those years of neglect add up and you’ll end up paying for it when your power bill comes in each month. The good news is, proper care and maintenance can keep that unit running at up to 95% of its original efficiency. The fact is, it costs a whole lot more to fix something than it does to maintain it. Sooner or later, neglect will catch up with you – and it’s when temperatures are high that your A/C is most likely to break down. Regular maintenance significantly decreases the chances of your A/C breaking down unexpectedly. A good will check out coils, check for leaks, check Freon levels, and check filters as needed. All those little things might seem negligible, but a small leak or dirty filter can end up doing serious damage to your perfect climate control – and your wallet – if the problem is allowed to escalate. A small investment now can save you some serious cash down the line. You may have gotten a great warranty with your A/C unit, but did you know that your factory warranty may be void if you neglect maintenance. Many manufacturers require annual maintenance for the warranty to be honored. Your A/C may still be technically under warranty, but if you’ve neglected maintenance, you might just end up having to pay for needed repairs out of pocket. If you want to stay cool this summer, an air conditioning tune-up is a good idea. It’ll ensure that you and your family stay comfortable without any unpleasant breakdowns. 1. Take advantage of heat from the sun. Open curtain on south-facing windows. 2. Adjust the temperature. When you are home and awake, set your thermostat as low as is comfortable. When you are asleep or out out of the house, turn the thermostat back 10 degrees. 3. Find and seal leaks. Look for air leaks around utility and plumbing pipes, Look for gaps around chimneys, recessed lighting and unfinished spaces. 4. Install tight-fitting, insulating drapes or shades on windows that feel draft after winterizing. 5. Add caulking and weather stripping around leaky doors and windows. 6. Schedule service for your heating system with JC Heating. 7. Replace your furnace air filter once a month. 8. Keep your fireplace damper closed unless a fire is burning. An open damper is like an open window, warm air goes right up the chimney. 10. If you never use your fireplace, plug and seal the chimney flue. According to the National Fire Protection Association (NFPA), roughly half of all home fire deaths in the U.S. result from fires reported between 11 p.m and 7 a.m. when most people are asleep. Did you lose power during a storm this summer or last winter. JC Heating installs Generac gas powered whole house backup gas generators. They are powered by propane or natural gas. Give us a call for a free quote. It's summer time and fuel oil prices are low, it's time to fill up your heating oil tank. Did you know that an oil burner cleaning & tune up call save up up to 10% on this winter's oil bill. Fall is coming, its time to tune up your heater. Call JC Heating for a tune up during the month of August and get $20.00 off our regular price. Air conditioners regardless of their age needs maintenance. Most homeowners forget about this and generally only think about the Air Conditioner when its stops working. Performing an annual maintenance can extend the life of your equipment. Annual maintenance can lower your electric bill. Did you know that most manufactures require proof of annual maintenance in order to keep your warranty valid? It's true skipping routine maintenance could void a warranty claim, which could end up costing your hundreds of dollars. So give us a call to make sure your system is working at its maximum preformance.